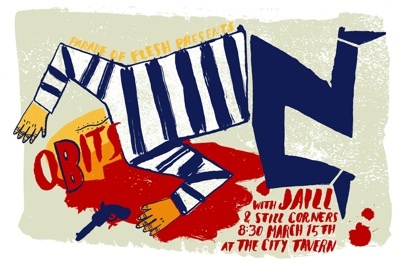 Free poster to first 20 people who come to Tuesday’s show w/OBITS & JAILL and Cocky Americans. (yes it says still corners, but they backed out of certain dates). Silk-screened artwork commissioned by illustrator James Heimer. OBITS (nyc)- NYC, ex-Hot Snakes/Drive Like Jehu: touring on their 2nd album for sub pop “Moody, Standard & Poor” – very limited tour dates. Mp3: ”Shift Operator” via subpop. JAILL (milwaukee)- also on sub pop. “Everyone’s Hip” via subpop. Cocky Americans (dallas) – just returning from a show in Canaduh! $8 advance/ $10 day of show HERE. 21+ only, or bring a parent if under. This entry was posted on March 13, 2011 at 12:44 pm, filed under News.